This is a remote wilderness area with no facilities and no developments. Visitors to this area must be self-sufficient and well equipped. Bring your own water, as potable water is not available in the park. Please note, July 6, 2015: Clendinning Park and Upper Elaho Conservancy are inaccessible until further notice due to the Elaho Forest Fire. Clendinning Provincial Park is an area of contrasts, with ancient forests, tranquil meadows, and spectacular relief dominated by heavily glaciated peaks, steep granite slabs, hanging valleys and icefalls. This undeveloped, roadless watershed provides the opportunity for wilderness backcountry recreation. Those with the skills to be self-sufficient in an isolated environment will find the rewards of an area steeped in natural values. Clendinning Park was established as a Protected Area on October 28, 1996. 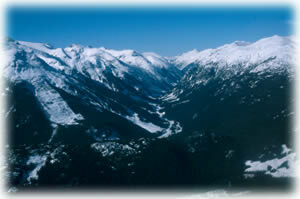 There is limited access to this remote valley 200 km north of Vancouver. Turn left on Squamish Valley Road off of Highway 99, 13 km north of Squamish. Continue along Squamish Valley Road, which turns into the gravel Squamish Forest Service Road. This is an active radio controlled logging road and a radio is recommended. Continue along the road as it follows the Squamish River and turn left across Bridge 2. History: In 1893 Stanley Smith and his partner, Mr. Doolittle, set off into the wilds of the upper Squamish River valley in search of Clark and Braden, two surveyors who had gone missing the previous spring. Smith's route penetrated the wild beauty of Clendinning Creek and Chilko Creek. Smith and Doolittle found only a cap belonging to one of the surveyors. In 1941 Arthur Dalton made the first ascent of Mt. Tinniswood, which he named after his father. Wildlife: This area provides important habitat for grizzly bears and black bears and is a migration corridor for black-tailed deer, goats, wolves and cougars. Approved Purpose Statement and Zoning Plan [PDF] is now available online in pdf format. Backcountry hiking is permitted, but there are no developed trails in this park. This Park is open to hunting. Please consult the Hunting and Trapping regulations for more information. Wildlife viewing opportunities exist in this park.